Good guest etiquette means arriving with something in your hand. Even if the host said they’re catering, have something other than your car keys. Hell, a packet of Ghostpops is better than nothing. But, when hosting a braai, snacks, and starters are most definitely required for good reason. The guests will start drinking more to stave off hunger and consume double helpings when the meal is finally served (disrupting the catering quota). Preparing snacks and starters is not an expensive, time-consuming exercise. It’s part of the braai vibe and great meal that everyone is there to have. What could be more welcoming than walking into a braai party with the atmosfire going and a colorful array of bites set out before you. 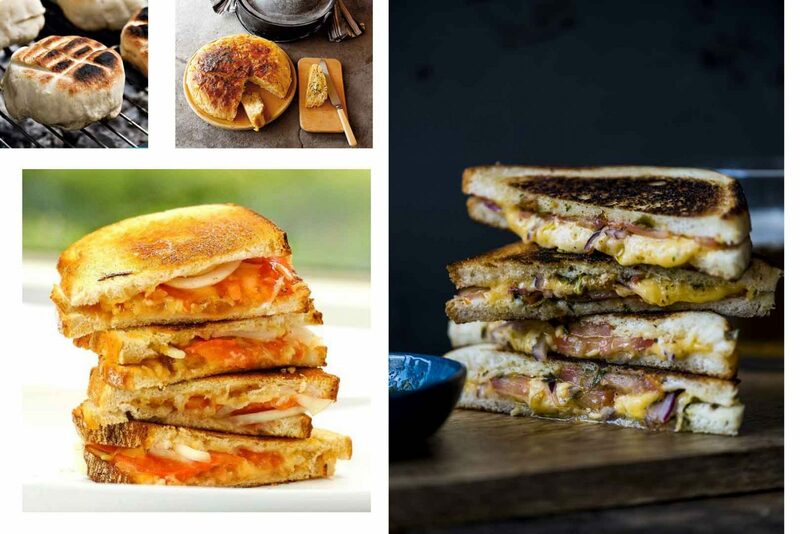 Whether you’re the guest or the host looking for snacks and starter braai ideas then we gathered some inspiration you could try for your next braai. Pretzels and nuts are traditional and fairly healthy snacks to serve. You can add a spicy crunch to this mix by roasting chickpeas over a pan on the fire. Add a dash of salt and paprika for a unique tasting nibble. Chips and a dip is very common snack. We’re here to be a bit more imaginative with our snacks and starter braai ideas. Dips however, are important to have. You can dip anything. Mini kebabs, cocktail sausages, fresh veg sticks, spicy chicken wings, meatballs, biscuits, and breadsticks. However, different types of spreads, pates, and dips will provide a wide ensemble of flavors for any snack. There’s Tahini, Hummus (with a hundred different flavors), Charred-Tomato Salsa, Roasted Red Peppers, Tzatziki, Onion dips, Peri-Peri, and Barbecue flavor, the list goes on. You can serve this before the meal, with the meal, or after a meal, but its listed as in the snacks and starter braai ideas because this is a braai. Not a cheese and wine. Halloumi is made from goat or sheep milk. Grilling slices of this Greek cheese is a real treat and takes about three minutes a side over the flames. Thread them onto a skewer and τέλειος ορίστε! Feta is another Greek cheese that can be grilled. Add large tomato slices, green pepper, chopped chilies, thyme, and olive oil. Top with feta and seal tightly in foil over the braai on medium heat for twenty minutes for a true Greek experience. θα λιώσει στο σκώρο σας. Always have the Fun-guy (fungi) at your braai. This versatile food can be transformed into an assortment of starters. 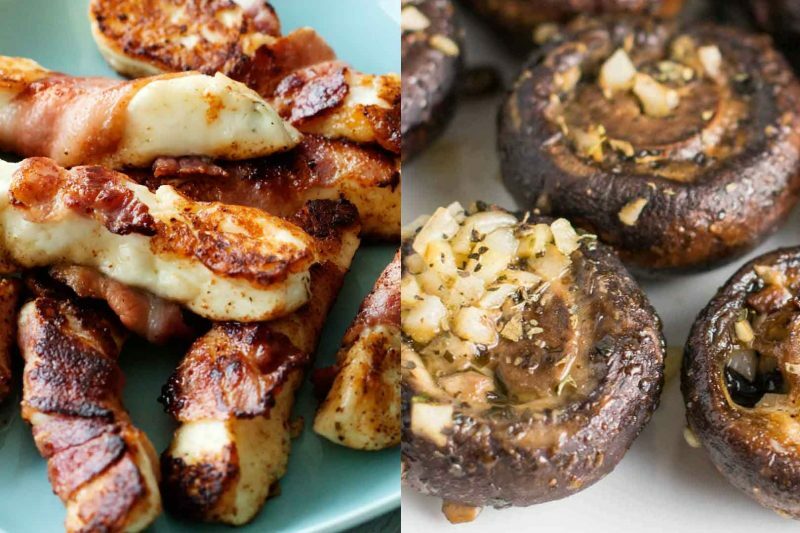 Crumbed mushrooms, mushrooms in bacon, mushrooms in cheese, mushrooms baked, mushrooms on a skewer, mushrooms are super snacks and starter braai ideas. We’re not talking raw fish and rice. We’re talking meat rolled ‘like sushi’. You can roll almost everything in a parcel of bacon that’s grilled over the braai. As for the biltong sushi, it is hard to part with good biltong but try expand its use as meat-sushi ingredients. The smell of freshly-made bread. Life’s little pleasures and making it over the fire is not as hard as you may think. You can take one of four roads. Make the bread dough, buy the bread dough, buy the bread mix, or buy the bread. Besides buying the bread, the other easier option is the bread mix. Add water, rise in potjie pot, cook in potjie pot. Done in an hour over the coals. Soup is mentioned here because it’s a good starter. It’s healthy and warms the tummy. But, is it a good starter for a braai? Or, is it more suited to a conventional sit-down meal? Your choice. Think of all those bowls you have to wash.
Before getting carried away with all these braai ideas for meat starters, consider how much meat you’re serving for the main course. They say on average we should only consume 60 grams of meat per person per day. Sounds ridiculously low but that’s what they say. They also say beer is bad. So…who do you trust? However, everything in moderation is a good balance. There’s a selection of vegetarian snacks and starter braai ideas but meat starters do add a juicy injection. Chicken wings in peri-peri, mini burgers, ribs, boerie kebabs, skilpadjies, and anything else you want to wrap in bacon or put on a skewer. Last but not least, provide toothpicks, serviettes, and paper plates. A good steak on a paper plate is not advised but it’s perfect for finger food (so don’t forget the serviettes. Cheap wet wipes are also a winner).